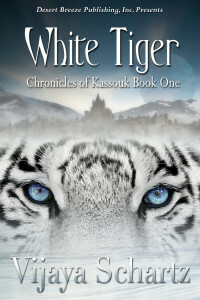 On the frozen plains of Kassouk, where a few aliens rule as deities on a medieval Human world, Tora — a Human warrior trained by tigers — seeks her father’s murderer. But what she finds at the point of her sword confuses her. How dare Dragomir, the handsome Mutant, question her bloodline and her loyalties? And could a new enemy control the savage hordes of the fringe? Dragomir offers to help, but Humans and Mutants are forbidden to fraternize under penalty of death… Should Tora trust her mind, her instincts, or her heart? In the vortex of war, treason and intrique… among blizzards, avalanches and ambushes… will Tora solve the mystery of her father’s death and unveil the secret of her birth? Can she and Dragomir escape persecutions long enough to save their planet from the invaders and fulfill their destiny?